For anyone unfamiliar with The Crucible, this production is an edge-of-your seat descent into the paranoia and terror of the Salem witch-trials. When Abigail Williams, played with an unwavering fire by Naïma Hebrail Kidjo, and several other puritan girls are caught dancing in the woods with a black slave from Barbados, Salem’s already festering distrust and suspicion bloom into a dense and thorny thicket. Tituba, played by Echaka Agba and the woman in question, is an easy scapegoat for the Puritans’ anxiety: white Puritan notions of black savagery and devilry take effect immediately, and are only exacerbated by the admission of wealthy Salem socialite Ann Putnam, played by Stephanie Shum, that she went to Tituba for fertility rituals. Ann has lost seven of her eight children in infancy, and believes that she is being targeted by a witch. After Tituba is violently coerced into confession of witchcraft by the Reverend Parris, played by Peter Moore, a cascade of accusations are set in motion that ultimately leave a wide and terrible swath of paranoia and death in their wake. Chief among the features that make this production uniquely challenging for audiences familiar with Miller’s work is the casting of people of color in roles written for white people. The racial politics of the play with regards to anti-blackness, xenophobia and faith-based violence are complicated by the optics of the cast, and the eventual desperate search for a uniting Original Sin (which is twofold: slavery and colonialism, though Miller does not explicitly or implicitly offer either American institution as such) in the town of Salem is confounded further. At once a statement of modernity, the choice to include people of color among the free peoples of Steppenwolf’s Salem also sharpens the class struggle and critique of xenophobia in Miller’s work. If nothing else, the casting gives Chicago an opportunity to see the massive talent of so many actors of color. Among those actors not already mentioned are Avi Roque (Ezekiel Cheever, Mary Lewis) and Travis Knight (John Proctor) both of whom deliver outstanding performances. Roque’s whole hearted commitment and considerable flexibility as an actor bring a vividness to characters that might otherwise fade, and their contribution to this cast is not unnoticed. Knight emphasizes the best and worst parts of John Proctor in equal measure, moving the audience in and out of admiration for him while also refusing to shy from his violence, cowardice, and manipulation. After all, Abigail is hardly grown, while Proctor is both married and in his thirties. Hebrail Kidjo’s portrayal of Abigail as seemingly confident and iron-clad highlights her deep isolation and its attendant terror. The defiant certitude of Abigail lays naked the spectre of paranoia and greed that haunts Salem, and asks the audience to contend with their own impact on the children in their lives, and their participation in a society that is at times disinterested in their possibility. While the relationship between these two characters might have been handled with a more attentive hand, Berry’s direction offsets Miller’s questionable ennobling of Proctor’s guilt and seeks to convince the audience of his self-interest. Similarly, Echaka Agba’s portrayal of both Tituba and the Judge Hathorne and Stephanie Shum’s multi-character portrayal of Ann Putnam, the young Susanna Walcott, and Martha Corey display versatility and finesse. The production as a whole is thrilling, and the talents of this cast bring a text that many read (or not) begrudgingly in school into a place of vivid immediacy. Arnel Sancianco’s design introduces a profound disquiet to the proceedings, and beneath the cold cavern of the arches the performance takes shape in the trembling and troubled denizens. Lighting by Lee Fiskness throws the humanity of each body into stark relief, accentuating each scene and providing an emotional foundation in which the actors’ performances shine bright. Costumes by Izumi Inaba place us firmly in the time period while also providing a stylish and intelligent language of their own. The question of how permeable the membrane between truth and falsehood really is, is displayed most prominently in the characters Mary Warren, one of the girls caught dancing in the forest and the Proctor’s housemaid, and Elizabeth Proctor, the wife of John Proctor. Taylor Blim and Kristina Valada-Viars portray two women who despite their best efforts, are swept into the current of terror that grips Salem. Blim’s Mary Warren, beseiged by the isolation and pressure that hangs beneath Sancianco’s arches until she has no choice but to explode and flee from the wreckage demonstrates how slippery the truth is, and how sticky a lie can be. Valada Viars plays Elizabeth Proctor, John’s lie-less wife, as a woman who must face choices deprived of any option for aid. Valada-Viars portrays Elizabeth’s bewilderment and pain with unflinching humanity, and at the moment when the audience wants to reach out to help her most, Valada-Viars’s performance makes Elizabeth’s choices all the more crushing. 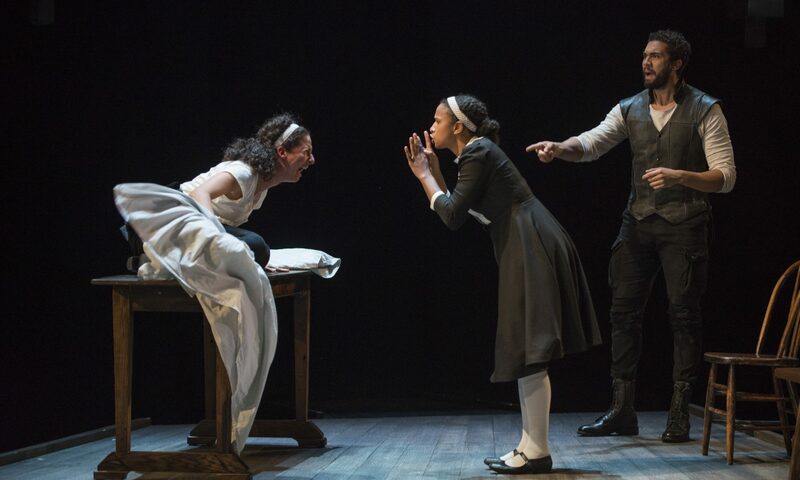 Profound in its interpretation, Steppenwolf’s production of The Crucible directed by Jonathan Berry is a sharp examination of community, paranoia, deception, and heroism. When does the truth become a lie? Who owns the truth, and who may wield its blade? Who owns a lie? Those who tell it? Or those who use it for their personal gain? All this and more down in Salem. Bias Alert: Lucas is the former Literary Apprentice at Steppenwolf Theater Company. This is their very first exposure to the work of Arthur Miller. Philip Winston (Thomas Putnam/John Willard).